Two spectacular show apartments are now available for viewing in the iconic Axis residential development under construction at Century City. The high rise block of 85 luxury apartments, of which more than 70% have been sold, is being built on a landmark site offering panoramic views. It is the most luxurious development undertaken at Century City by Rabie to date. John Chapman, a director of Rabie, says each apartment has been meticulously designed to optimise views, light and to provide a generosity of space that extends to the provision of ample external terraces. High-quality finishes have been specified both internally and externally to ensure the long-lasting beauty of the contemporary design. 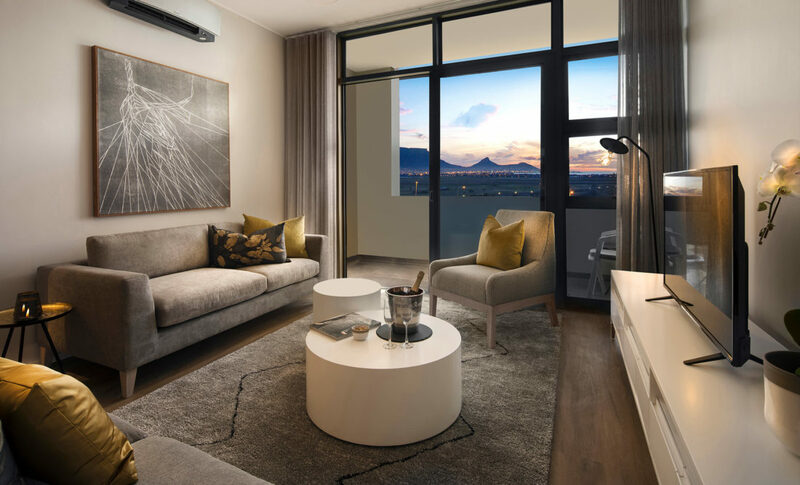 All apartments will boast high-end finishes, Smeg appliances and will have Fibre To The Home providing them with access to high-speed connectivity which has become synonymous with Century City. Basement parking is being provided on a ratio of one bay for each one bedroom apartment and two bays for all two, three and four bedroom units. Basement stores are also available. The building will boast a state-of-the-art external cladding façade giving it an extremely upmarket finish while a 24-hour concierge in the entrance court will complete the exclusive nature of the development. Axis, which is due for completion by the end of 2018, is being built adjacent to the vibrant Century Square development, the new commercial and hospitality hub of Century City with its popular restaurants, bars and bustling public square as well as the Century City Conference Centre & Hotel and Virgin Active gym. Both two bedroom show apartments are available to view strictly by appointment as the rest of the building is still under construction. To book an appointment to view the apartments, prospective buyers should please contact Devon Usher on 082446 9188 or Tamarin Smith on 084 3018616. Meanwhile, the entire 1000 square metre commercial component on the ground floor of Axis has been let with tenants including a Japanese style restaurant, Akiya Sushi. Akiya Sushi, which will open in February 2019, aims to immerse their clients in an authentic experience including their culture of delightful tea, Dim Sum, authentic Asian cuisine and plates of expertly created Japanese sushi, their speciality.